It’s no secret that Google has spent billions of dollars improving its’ search algorithm to quickly answer users’ questions. In this quest, they’ve begun to remove actual websites from the end result by listing answers right in the SERPs – and with “off-line” products that respond back to questions immediately, like Google Home and Google Now. 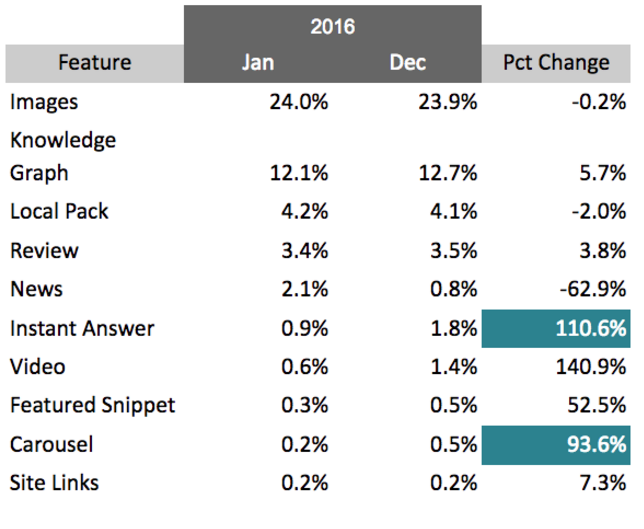 From a study we conducted, we discovered that Instant Answer and Featured Snippets across all industries doubled in 2016. For the healthcare industry in particular, Google has rolled out various forms of Instant Answer and Featured Snippets that will change the way healthcare marketers reach users online. In this post, we’ll review evidence from our study showing how Google is continuing to ramp up in-SERP answers and what a future user experience with Google could look like in 5 years for healthcare marketers. Lastly, we’ll give you actionable takeaways on how marketers can continue to be a part of the user’s online journey now and in the future. We performed a study across the top health sites from Alexa.com (an SEO analytics company that ranks websites) to find we’re at the nascent phase of Google’s “oracle” trend. We pulled SERP feature data from SEMRush for 10,000 websites, across 400+ topic categories in 2016. We found sweeping trends across all industries, but we’re going to dive into the healthcare industry specifically because of the largest implications it has for that market. Today, when first looking for healthcare information online, a user searches for definitions and background on a disease, treatment or virus. Most of this important definition-style content is now directly answered by Google in the SERP. Why should a user take the extra step to leave the SERPs, when they can learn what hypertension is right in the SERP? Google’s presence here is nothing new, but we’re seeing instant answers and carousel results double in 2016. In the future, if Google continues to directly answer users questions without having them leave the SERPs, and store user information like preferences, search behavior, and physical location at the pace it has been, Google will become a user’s ultimate source of information. With this in mind, we mapped out an example scenario of how Google could guide a user through a healthcare search journey in the future. Let’s say Sarah just injured her knee running and needed help. Rather than calling her doctor (because she has yet to find one in the area), she turns to her Google Home to help guide her search for the perfect doctor for her knee. Sarah: My knee is hurting again. Google: It should be healed by now. Did you stress yourself during your run today? Sarah: I might have. I landed on it weird. Google: Want me to book another appointment with Dr. Weisse? Sarah: Maybe I should go to someone else. I didn’t really like him. Google: There are 4 doctors close by. I’d recommend Dr. Tulumi because he has the best ratings, great bedside manner, written several research papers and went to the top medical school for orthopedics. Sarah: Sure, can they see me today? Google: You bet, they have an opening at 1:30. I’ll book that time slot and have a car pick you up. Make sure to ice it until the appointment. Sarah didn’t visit a hospital website or directly convert there. Instead, Google guided her through the conversion journey—and ultimately converted for her. In the future, Google most likely will be able to tie together personal information specific to the user – like health history and local proximity – then couple that information with broad, research information like a doctor’s bio and reviews. How can marketers remain a part of the user journey online? First, you need to begin resetting expectations on traditional marketing metrics, like traffic, and start focusing on measuring success by how well you connect with your audience—even if that means losing visits to your website. We get it—connecting with your audience is a lot easier said than done. However, by leading with an audience-first approach, you can continue to drive successful marketing campaigns. Google does an excellent job of providing users with definitions, and high-level information that starts their research journey in healthcare. However, healthcare is complex and goes way beyond understanding what a disease means in a dictionary. For example, if someone is searching for information about cancer and the different stages, most likely they are in pain, or helping a family member get better. Healthcare marketers can be the bridge to connect this user in need with a doctor, or healthcare expert. By interviewing customers and diving into audience research, healthcare marketers can learn more about a user’s intent behind the search and provide them with informative content and resources beyond definitions and symptoms—this is something Google will never be able to do. Your physicians are an untapped data source that can be the key to humanize your brand and connect with your audience at a deeper level. They are your direct touch point to your patients, so leverage your practitioner’s knowledge and expertise to formulate engaging content that speaks to your visitors’ needs. Start by interviewing your physicians and expert practitioners on a regular basis to shape your marketing campaign to accurately convey your service offerings and unique approach to your procedures. Visitors and search engines, alike, use on and off page signals to deem you locally relevant in your given geographic area. Off page local listings, like Google My Business and business directories, are ideal to ensure that patients who actively look for your services are able to find you. It’s also critical to include locally unique content (i.g. city and state modifiers, amenities nearby) on-site about your hospital and specialty center location pages. Additionally, the more accurate your Name-Address-Phone (NAP) is listed across the web, the better chance users and search engines will be able to determine where your specialty centers and hospitals are located. Learn more about local search here. As Google’s “off-line” search devices, like Google Now and Google Home expand their user-base, it’s important to optimize your content for voice search. In many cases, Google will pull information directly from rich snippets, such as answer boxes or knowledge graphs. Marketers can optimize their content for these rich snippets using a variety of content techniques. Learn about the most common types of enhanced SERP features and optimize accordingly. It’s also important to note that knowledge graphs pull information from Wikipedia. I recommend checking the Wikipedia page on your brand and making sure the information is up-to-date and accurate. 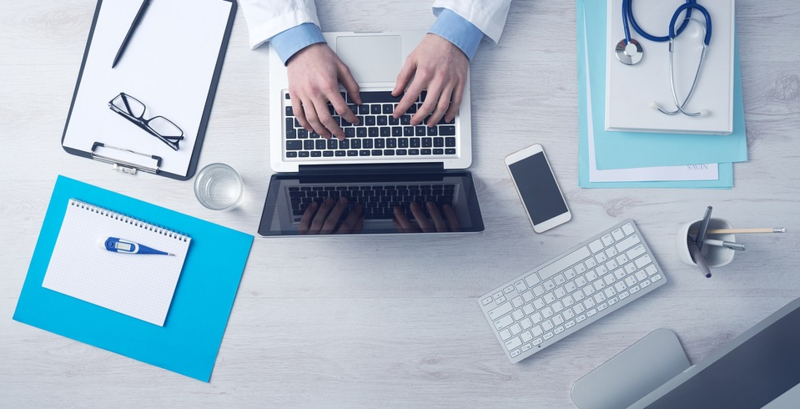 By creating unique and useful content that Google cannot easily produce, healthcare marketers can continue to connect with users and provide them with the resources that they need. As a healthcare marketer, how has your search strategy changed with the rise of Google’s in-SERP features?